I am the heart of Cape Breton. Four colours and four forces work within a circle to bring balance to my people. I give this as a gift to you to guide your life and your works with me. Mi’kmaq Elders brought the Medicine Wheel to the project. A wheel of four quadrants: Knowledge, Action, Spirituality and Feelings. For the Bras d’Or system and the project to be healthy, the four quadrants must be in balance. As much time and effort must be spent on gathering knowledge about the Lakes as is expended understanding the Spirit of the Lakes and its peoples. Actions in and around the Lakes must be balanced by our Feelings about the Lakes. The Bras d’Or Lakes CEPI recognizes the importance of making decisions that will respect the diverse needs of the environment as well as of our communities. 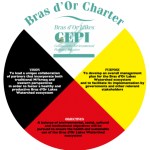 To achieve this balanced approach, the CEPI has adopted the Medicine Wheel as a guide for the management of the Bras d’Or. The Medicine Wheel is an ancient symbol that provides the basis of many Indigenous Peoples’ philosophies throughout North and South America, and in other forms is recognized globally. It has been adopted by the Mi’kmaq and by many other tribes as a teaching tool to help illustrate several key concepts. the need for equality of the physical, mental, emotional and spiritual aspects of our lives and of our cultures. When the elements are not treated evenly, the Medicine Wheel is out of balance, and individuals and communities will suffer. the synergy of the elements with each other. The elements of the medicine wheel cannot be pulled apart like pieces of a pie. It is only through working in their entirety that individuals and communities can stay on the path toward wellness. the cycles of existence. Time is never-ending, as each season progresses to the next, life to death to life, year after year, the cycle is circular and has neither beginning nor end. We recognize that in order to maintain our own health, we must give equal consideration to the physical, mental, spiritual, and emotional aspects of our lives. Becoming life-long learners in all four quadrants balances and completes us. We need to exercise and eat a balanced diet (physical); reduce stress and experience personal growth (mental); interact and communicate with nature and our spirituality (spiritual); and maintain relationships with our friends and family (emotional). Much of our time here on earth is spent out of balance: we may eat too much, pray too little, and take on too much stress. We neglect to take care of ourselves and in so doing, we neglect what we cherish in Mother Earth and all that she provides. There are many different ways that the basic concept of the Medicine Wheel can be expressed. It can be adapted to reflect the different stages in your life or your relationship to your surroundings. The CEPI has adapted the Medicine Wheel to be reflective of our planning process – in fact, the Medicine Wheel can be seen on the Bras d’Or Charter, and therefore, at the hear t of the work of the CEPI. It is a tool that will guide us in how we interact with one another and our environment. The CEPI acknowledges that no decision should be made based solely on one element of the Medicine Wheel, while understanding and embracing the need to take a well-rounded approach to everything we do. Everything has to be balanced across the four quadrants. Traditionally, our knowledge has been the foundation for decision-making (Action). However we must also listen to and respect the Feelings of others in deciding on our Actions and Knowledge gathering. Another impor tant aspect that we don’t often consider in our decision-making is the Spirit of the Lakes. The Bras d’Or is the hear t of Cape Breton and has a special significance and place in the hearts of all the people of the Bras d’Or. It is only by listening to the Spirit and our own hearts that we will be able to make decisions that will ensure that the Bras d’Or Lakes will be sustained for the enjoyment and benefit of all generations. When considering the Medicine Wheel, it is important that we begin to understand the concept and practice of spirituality. Spirituality is the belief that governs each and every action of an individual, or group. For example, the Mi’kmaq hold the belief of universal equality: all life and the non-living, including forces unseen, were created equal - from the smallest plant to the largest mountain, or the deepest sea. The Mi’kmaq people recognize and acknowledge the living spirit in all aspects of Mother Earth (living and non-living). These spirits are acknowledged as relations and are respected rather than worshipped. As our relations, all those things around us are connected to us.